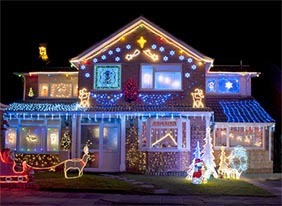 A lot of people get into the holiday spirit by decorating their homes with festive items both inside and out. But since those decorations sit in boxes for the majority of the year, it can be annoying to have them taking up any amount of space in your apartment or house. Instead of wasting space in your home on belongings that are only used for the holiday season each year, you can rent a storage unit and use your home’s space for more practical means. 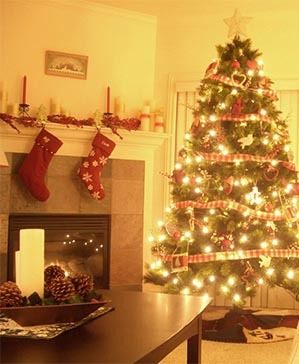 For those who are really festive, your holiday decorations can take up a lot of space, so getting them out of your home can be the ideal solution. Consider renting a small storage unit to store all of your holiday decorations through the remainder of the year. Since holiday decorations often includes lights, lawn ornaments, artificial trees, and tons of trinkets for indoor décor, there are many reasons to rent a storage unit. What Storage Unit Sizes Work? For the average person, a 5x5 storage unit will be more than enough room for storing all of your holiday decorations. But storage units aren’t always one-size-fits-all, so here’s a short guide based on your level of holiday cheer. A smaller storage unit, such as a 5x5 or 5x10, should be enough room for almost anyone who’s storing holiday decorations. A 5x5 is about the size of a large closet, so it has plenty of space for outdoor and indoor decorations, holiday lights, and an artificial tree or two. If you have a little more than that, a 5x10 will be able to handle the extra. If you’re borderline obsessive about the holidays, you can upgrade to medium-sized storage units, such as a 10x10 or 10x15 storage unit for your holiday decorations. 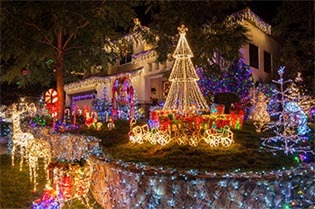 If you want to blow your neighbor’s holiday displays out of the water, these sizes will help you store everything you’ll need to get the job done, including 250 strands of lights. If you want to go completely overboard, you can rent a 10x20 or 10x30 storage unit for your holiday decorations. Being the size of a single-car garage, you’ll have enough room to have a workshop full of jolly elves making toys. Or you could use the space to create the biggest Holiday village collection in your state. Which Storage Amenities Should be Considered? Depending on what you’re storing, there are a few features that can be beneficial when storing your holiday decorations. It depends on what you’re storing, but climate-controlled storage can be a great feature for those who have collected ornaments throughout the years and have some that are old or homemade. These types of items can easily be damaged by extreme temperatures. A lot of people have holiday decorations that have been passed down from their families or otherwise hold a lot of personal value. If you want assurance that your valuables will be well-protected, choose a storage facility that has great security features, like alarmed units, video surveillance, and more. Storage units can be found in many shapes, sizes, and styles. Some storage facilities are large warehouses with wide hallways and internal access to each individual storage unit while others are narrow buildings with external access to all storage units. When storing your holiday items, you’ll want to consider the differences between storing in an indoor storage unit and a drive-up storage unit. If you’re storing sensitive decorations, like glass ornaments or antique décor, an indoor facility will better protect your items from the elements. The more walls between your things and the outdoors, the better. Since there are more walls, there are also more doors. With each door you need to go through, the security level increases. Your belongings will be very safe in an indoor storage unit. Outdoor storage units with drive-up access are great for those who will be moving items constantly and need a quick way to get to their storage unit. External access storage units are generally less expensive than their internal counterparts.